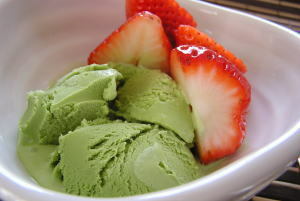 Matcha Aisu Kurimu ('抹茶アイスクリーム', is classified into sweets), is known as Green Tea Ice Cream in English, and 抹茶冰淇淋 (Mǒchá bīngqílín) in Chinese. It is the Japanese style sweets. Green Tea Iced Cream, Matcha Ice. Egg White, Milk, Whipping Cream, Granulated Sugar and Water, Vanilla, Matcha Powder.